Dental sealants are a thin coating applied to the back teeth, specifically on the chewing part of the premolars and molars. It is used by the dentist to prevent tooth decay since they act as a barrier to "seal-off" the grooved and pitted spaces of the tooth. It is primarily for children and adolescents, but can also be applied to adult patients. The sealants protect children’s premolars and molars when they first come in. The coating lasts approximately 10 years. Applying sealants at a young age will prevent and protect their teeth for a long time. 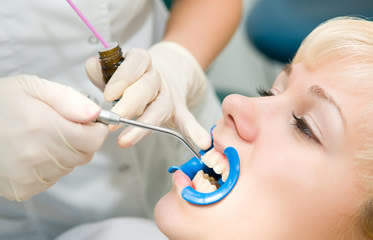 Before the sealants are put on, the teeth are cleaned and then acid is applied to the chewing part of the teeth. Once the acid is dried, the sealants are carefully painted on. They harden in the grooves providing long-term protection. Dr. Muradina, our Simi Valley dentist uses this technique to keep your children from having problems down the road. Our main priority is providing comfort for our young patients while also promoting oral health. Call our Simi Valley dentist today for an appointment.